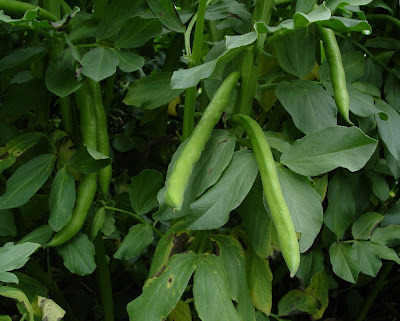 Its harvest time for our fava beans, the longest pods are 12-13 inches. 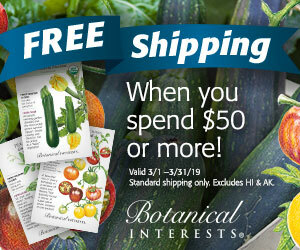 To enjoy them we first have to shell them from their pods. Simply cut down the long length of the pod and pull out the beans. 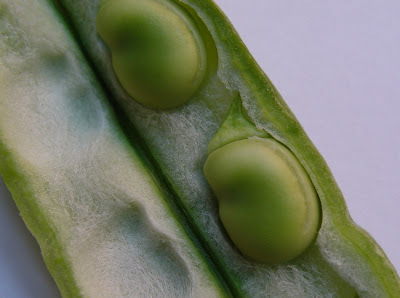 Notice the thick inner lining of the pod that protects the beans like a warm winter overcoat. As you shall see there are in fact two overcoats. This explains why this particular legume is a cool-weather crop while others in the family like pole and bush beans prefer warm weather. Take one look at this double overcoat and it all makes sense. 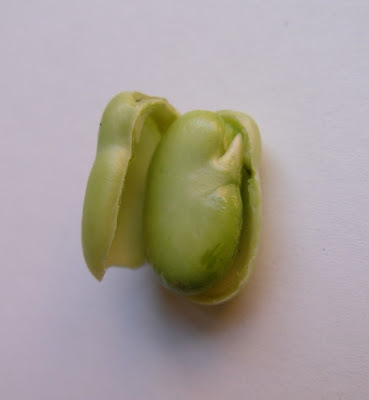 To cook favas, bring a large pot of water to a boil, add salt, then the beans, and cook 3 to 5 minutes. Drain in a colander. Next, peel off the outer white skin (the second jacket) by pinching through the skin opposite the growing tip. Press the growing end of the bean between your thumb and forefinger and the bean will spurt out. The simplest way to enjoy them is to sauté the fava beans in a little olive oil or butter until tender and then salt and pepper to taste. For those a little more adventurous try fava beans in place of garbanzo beans in your favorite humous recipe. And for those who are truly gourmands or inspire to be…Fava Bean Soup with Short Ribs. 1) Make a beef stock from short ribs. Strain and save meat. 2) Cook the fava beans in the beef stock until soft and tender. 3) Puree beans in a blender adding just enough stock to liquefy. 4) Salt and pepper to taste .